Ehime: "Mommy has a recipe that she always wanted to try. That's a prosciutto & arugula pizza with fig spread. Let's see how they can make it tonight." 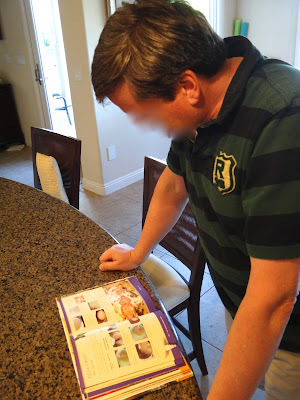 Daddy: "Well, what we need to do first is to mix dry yeast and warm water together and then add into flour mixture." Daddy: "Can you drizzle some olive oil in the bowl, honey? I need to coat this dough in oil." Mommy: "Let's cover it with the wet towel now. We don't want to make the dough dry." Kona: "How are you doing so far, daddy?" Daddy: "I think we are doing well so far." The dough had to rest for 1-2 hours. 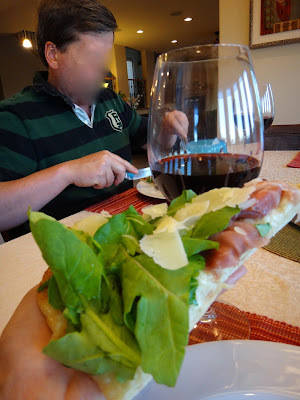 While we were waiting, my husband opened a Pinot Noir and poured into the glasses that I gave for his birthday. 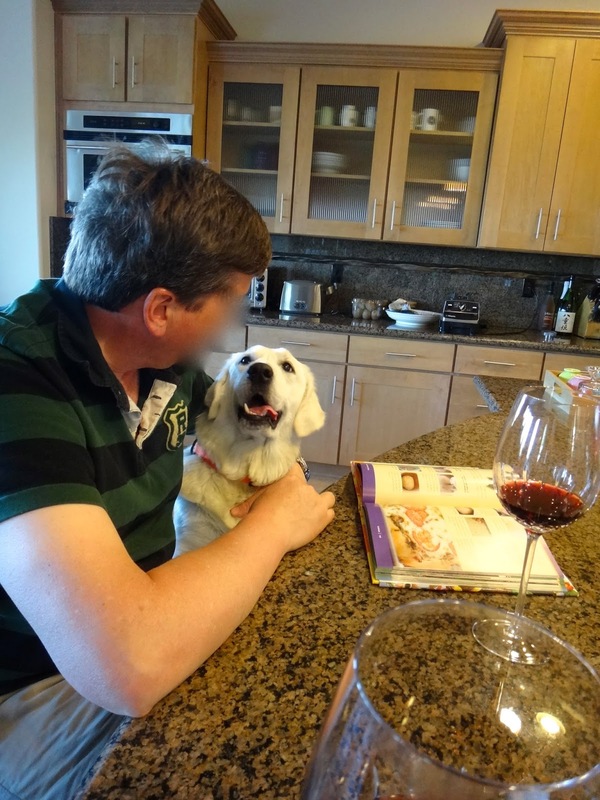 Ehime: "Are you having Italian dinner tonight, daddy?" Daddy: "Um... ask your chef." Mommy: "I washed some arugula and thinly sliced fresh mozzarella cheese." Daddy: "I think the dough is ready." Kona: "What happened to this dough in Ziplock?" 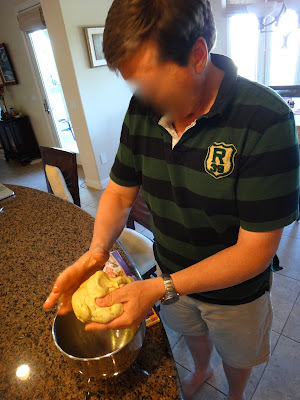 Daddy: "We need only half of the dough for now, because there are only two humans in the house. We can put this in the freezer and make pizza another time." 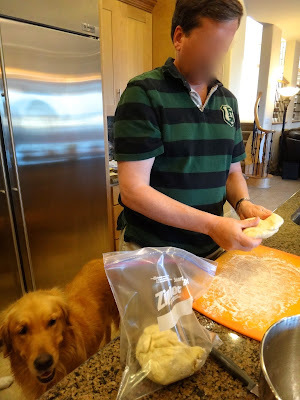 Daddy: "Let's toss the dough. Huh!" Ehime: "Daddy, you have flour on your shirt." Daddy: "Mmm, thin crust pizza looks yummy♪"
Kahlua: "Mmm, fresh mozzarella cheese looks yummy♪"
Mommy: "About 10min in the oven. 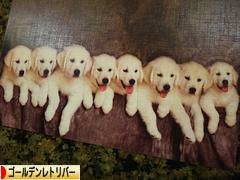 500F is quite a high temperature." Daddy: "It's done! Let's put prosciutto on it." 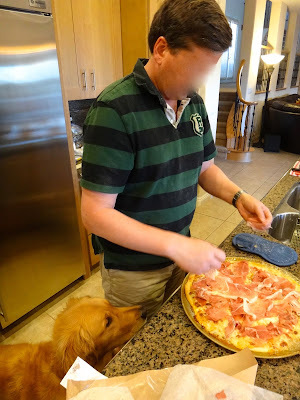 Kona: "Prosciutto looks delicious, daddy." Daddy: "Yes. 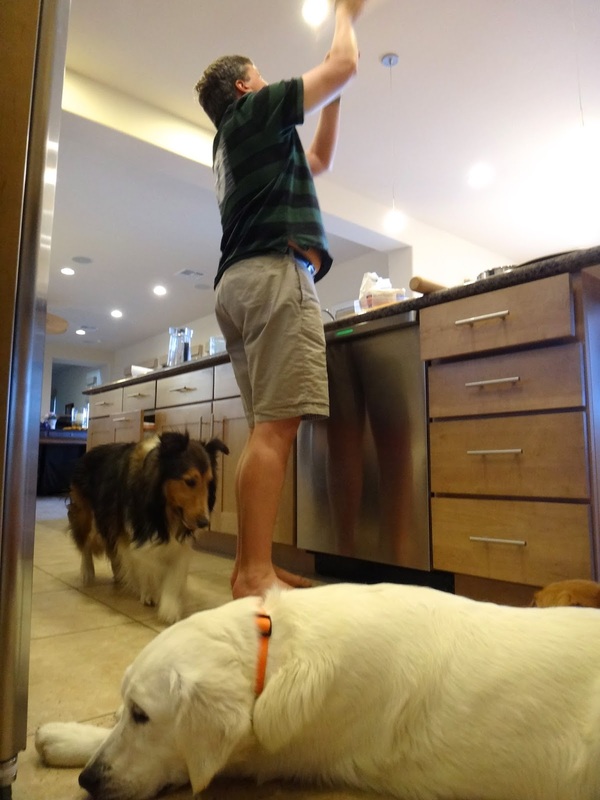 We went to Whole Foods and asked the meat counter to slice prosciutto for us." Daddy: "Arugula is on, and freshly grated Parmesan cheese is on. Now let's cut the pizza♪"
Kona: "Pizza looks great. Um... did I tell you I didn't eat dinner yet, daddy?" Daddy: "I saw you had dinner a little while ago." Daddy: "Mmm, what a sophisticated pizza!" For Kona who absolutely wants to try prosciutto someday, please click the puppy photo on the right above or a dog picture below. Thank you!